The most destructive water damage losses in homes come from broken or burst washing machine hoses. It is recommended that you replace your machine’s rubber hot-and-cold hoses with woven steel hoses. 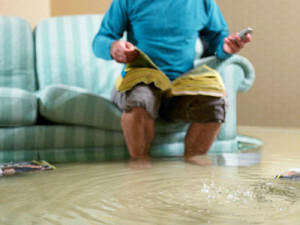 This simple upgrade could save your home from serious water damage problems. Know your water supply: Know where shutoff valves for the main water supply, certain appliances, sinks and toilets are located in your home. In the event of a leak, you can quickly shut off the appropriate valves before calling a plumber. You can help prevent future leaks and water intrusion by regularly inspecting the following elements in your home and making sure they remain in good condition. Air Conditioners: Check drain pans to insure they drain freely, and that no standing water is present. Make sure drain lines are clean and clear of obstructions. Clean drain lines with compressed air or by pouring a water-bleach solution down the drain line until it flows freely. Exterior Walls: Exterior walls should be kept well painted and sealed. Landscape features should not include soil or other bedding material mounded up against walls. Flashing: Flashing, which is typically a thin metal strip found around doors, windows, thresholds, chimneys, and roofs, is designed to prevent water intrusion in spaces where two different building surfaces meet. Humidity: Condensation on windows, wet stains on walls and ceilings, and musty smells are signs that you may have too much humidity in your home. Check areas where air does not easily circulate, such as behind curtains, under beds, and in closets for dampness and mildew. Be sure to use bathroom exhaust fans following warm showers or baths. Irrigation: Inspect and adjust the spray pattern of the irrigation heads to minimize the water sprayed directly onto the house to avoid excessive water near the foundation. Landscaping: Keep trees trimmed so that branches are at least 7 feet away from any exterior house surface. This will help prolong the life of your siding and roof and prevent insects from entering your home from the tree. Vents: All vents, including clothes dryer, gable vents, attic vents, and exhaust vents should have hoods and should exhaust to the exterior. Make sure all vents are in good working condition.